Are you starting feel the Spring excitement? Is it time to update your blog design? Feeling drab and want to go to fab? 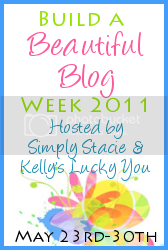 The Build A Beautiful Blog Week is for you! There will be helpful tips, articles and….. GIVEAWAYS! Kelly’s Lucky You and I will be hosting the event again this year. We’ll have a boatload of professional designers (now that’s a mental picture, isn’t it?) waiting to help you refurbish, redesign and makeover your blog. Enter to win gift certificates, free design elements or one of many entire makeovers! Last year, more than fifty people won prizes!! Come back for previews and the week-long event starts May 23rd! Can’t wait to enter? For extra entries, write a post now about our event and/or post our button on your blog. Are you a designer and would like to participate? Email KellysLuckyYou at yahoo dot com! Sounds like fun! I’m switching over from blogger to WP and this sounds like it just might help! Found your beautiful blog through Blog Hop Tuesday. Stop by and say Hi soon! How exciting! I sent you an e-mail about offering a giveaway. Can’t wait to hear back from you. I TOTALLY need some blog help!! I’m a new blogger, I don’t have tons of time to devote to the design of it, I’m jealous of others’ pretty blogs and I want some pretty, too! Try the button on my sidebar- I always have problems posting grab code in my posts. No idea why! Well I’ve had the button posted for quite a few weeks already, but I have to say am super pumped about this….my poor brain hurts sometimes from fiddling with my blog…so any advice, tips, freebies, etc to be gained from this event…I’M ALL ABOUT!!! !